Listening to oral argument recordings from various cases presents an opportunity to try and read the tea leaves as to where the Federal Circuit is heading with respect to a particular area of the law. The oral argument in Walker Digital v. Microsoft, 2011-1419 (Fed. Cir. 2012) presents one such opportunity. In the oral argument of Walker Digital v. Microsoft, which was argued on March 9, 2012, Judge Moore made a comment about the patentee having a problem if the claims were construed in such a way that they required joint infringement. The Akamai v. Limelight and McKesson v. Epic cases were argued en banc four months earlier — so, presumably, Judge Moore knew as of March 9, 2012 which way the CAFC was headed in deciding those cases when she made her comment. You can listen to the sound bite yourself and see if you think it indicates how the CAFC will decide those en banc divided infringement cases: [Listen]. As a sidenote, Judge Moore also took a friendly shot at patent prosecutors and their alleged deficiencies when it comes to knowing the rules of grammar: [Listen]. Ouch. Of course, a patent prosecutor is entitled to be his or her own grammarian. See Chicago Steel Foundry Co. v. Burnside Steel Foundry Co., 132 F.2d 812, 814-15 (7th Cir. 1943), cited in Jonsson v. Stanley Works, 903 F.2d 812, 820-21 (Fed. Cir. 1990). Federal Circuit court watchers interested in section 101 issues might want to take note that the Federal Cicuit has denied en banc review in Fort Properties v. American Master Lease, LLC, 2009-1242 (Fed. Cir. 2012). The denial is referenced on the court’s weekly disposition page: [Link]. [I] didn’t think it was a close call at all. I felt that it was easy passage through Section 101. But the Supreme Court’s ruling is attitudinally a throwback to pre-Chakrabarty cases like Gottschalk v. Benson and Parker v. Flook. It presents a vague standard. How are the more than 7,000 patent examiners and the thousands of patent attorneys and judges going to apply this? It’s going to be chaos unless the Supreme Court reworks this territory. It’s most unfortunate. While it is too bad that Chief Judge Michel has retired from the CAFC, it is nice that he is now free and willing to speak his mind. Front row: Judges Clevenger, Plager, Newman, Rader, Mayer, Lourie, and Schall. Back row: Judges O’Malley, Prost, Linn, Bryson, Gajarsa, Dyk, Moore, Reyna, and Wallach. 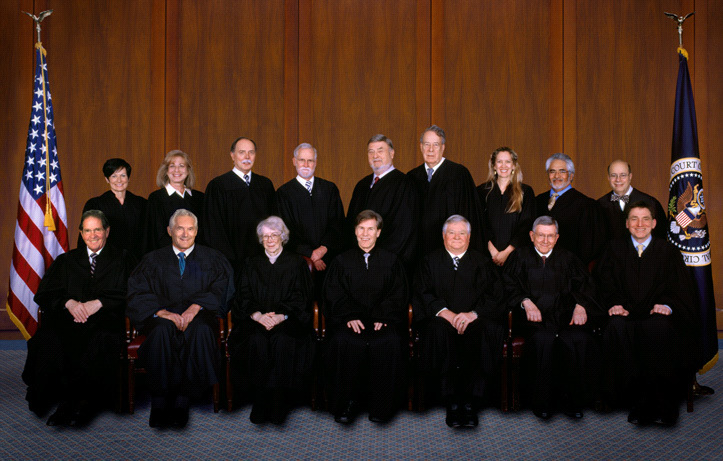 How Long Does the Federal Circuit Take to Decide En Banc Cases? The oral arguments in Akamai v. Limelight and McKesson v. Epic took place over 5 1/2 months ago. I was curious how long it normally takes the court to issue its en banc opinions. If the chart below showing recent en banc cases is any indication, the decisions should be issued soon. The U.S. Court of Appeals for the Federal Circuit is one of only two federal appellate courts that Sandra Day O’Connor has not sat on by designation since retiring from the Supreme Court. The other court, also located in Washington, D.C., is the U.S. Court of Appeals for the D.C. Circuit. I’m not sure why Justice O’Connor has not sat with the appellate courts located in Washington, D.C. Perhaps it is by coincidence or perhaps it is by design. If by design, the Federal Circuit’s upcoming visit to Colorado this fall would afford it an opportunity to invite Justice O’Connor to sit with the court outside of Washington, D.C.
Each year the Colorado Bar Association publishes its annual survey of legal developments from the previous year. I wrote the chapter this year for developments in intellectual property law. Most if not all of the developments covered in my chapter were at the federal level; so, the chapter might still be of interest to those of you who don’t practice in Colorado. At any rate, if you are looking for a concise summary of the major patent, trademark, and copyright developments from 2011, you can order/download a copy (for a nominal fee) [here]. I have added an “audio key” to the blog that attempts to provide a representative sound bite of each judge’s voice. Hopefully, this will help people identify a particular judge when listening to recordings of oral arguments. You’ll see the link to the audio key on the upper right hand portion of the site. You are currently browsing the 717 Madison Place blog archives for May, 2012.